Sometimes we have a second to decide what to do in a situation, and we don’t always know the consequences of our choices. Last week I wrote about my aunt Eva in a post about some of her life. During the WWII her sister-in-law lived very close by Eva and her family. In the last year of the war, the resistance against the German occupation increased and the penalties were death sentences. One day a young man chased by the Gestapo were running around in the area where Ingeborg and her husband lived. The young man slipped into the garden, knocked at the door AND was helped and hid until he could leave for some other place. The Gestapo never found out about it. If found guilty of aiding the young man their house had been bombed, and they had been shot. Ingeborg had a sister called Guldborg. Her husband called Skriver Jensen ( Skriver is Writer!). He was a police officer, and at the 19th of September 1944, the police were taken as many as they could at a false air raid alarm. Many were gathered and sent to concentration camps. I don’t know how Skriver Jensen escaped the situation. Maybe he was off that day and heard something about it. Skriver Jensen went to an institution for mentally deficient people and played the role of an imbecile person. He went into hiding after that. During the last months of the war, most of our Jewish citizens, the police and the resistance people survived in the KZ-camps were collected by a massive effort by the Swedish Red Cross and Danish voluntary people. The inmates were taken home in the so-called “White Buses”. Unfortunately, so many other Kz prisoners were not helped. Skriver Jensen took part in this too. 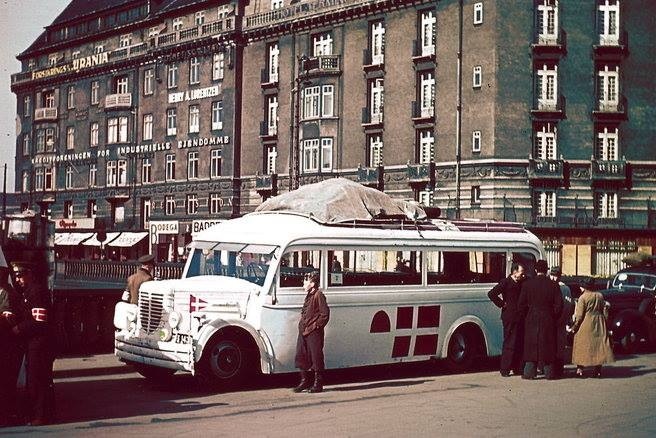 Passing through Germany at that time was extremely dangerous, but the busses were painted white with huge red crosses on so that the allied bombers wouldn’t hit them on the road. Not all managed the travel but died from hunger and diseases. After the war, he went down again and helped to identify people by examining the teeth of dead Kz prisoners. Hearing about this as a child made a huge impression on me. The photo collage is taken the last 4th of May at “Mindelunden” in Copenhagen. Resistance fighters are buried there or have memorial stones. At the wall, the names of those who were never found in the Kz camps are mentioned. If I was in a similar situation would I help without thinking about the consequences of my life? I hope I would. We still have to fight for freedom today. It’s crazy to think what people went through! I’ve been watching some documentaries of history lately – it is heart-wrenching and mind-boggling to think of what evil humans can do to one another, and yet what amazing, heroic good can be done by individuals and groups. The human heart is a mysterious thing. I’m sure we all like to think we would make the right decisions, but you do pose a difficult question that might only be answered in the moment. I cry each time I listen to testimonies as I found them so terribly sad… But at the same time, I think that hope is still among them and courage too… So I always feel inspired and grateful for what I have. Maria, Thank you for sharing these stories. It is something to ponder how evil and good humans can be. One always hopes that our own hearts and nature will lead us to the hero’s path of good.